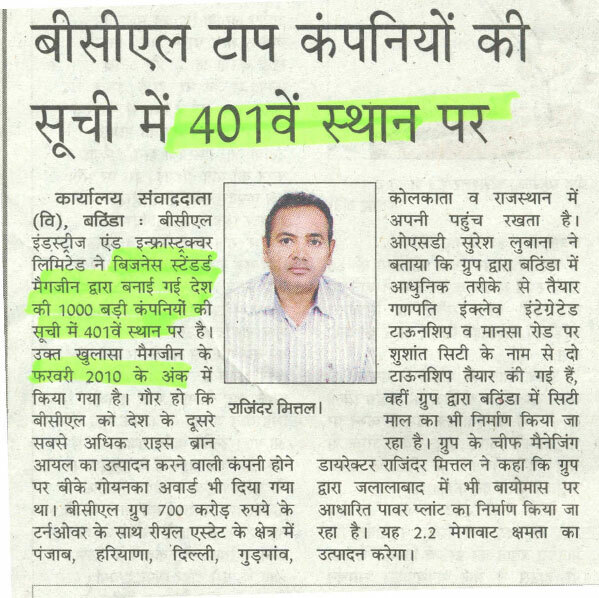 In February 2010, BCL Industries and Infrastructures Limited ranked 401 of 1000 companies listed in Business Standard Magazine. The company was awarded by B.K.Goenka Award for “Second Highest Producer of Refined Rice Bran Oil” in the country. The 700 Crore turn over BCL has real estate business in cities like Punjab, Haryana, Delhi, Gurgaon, Kolkata, and Rajasthan. OSD Suresh Labhana told the group used state of the art techniques for two integrated townships named Ganapati Enclave and Sushant City, the same company has also commenced constructing the City Mall. Groups’ Chief Managing Director Sh. Rajendra Mittal told that power plant based on biogas fuel will be commissioned at Jalalabad. generating 2.2MW.